I've been a devoted Wellie fan since my mom bought me my first pair — black and yellow plaid from J. Crew — for Christmas one year. I relished the chance to break them out at the first sign of an overcast day and wore them until the rubber cracked. In college I converted to Hunters and bought a pair of the classic tall Wellies that I beat to death over the course of five years. But after almost a decade of sporting the traditional rain boot style, I'm looking for a change. So, it seems, is Hunter. After checking out the Hunter Original Spring/Summer 2015 collection, I'm excited to report that the inclement weather staple is branching out in a big way. 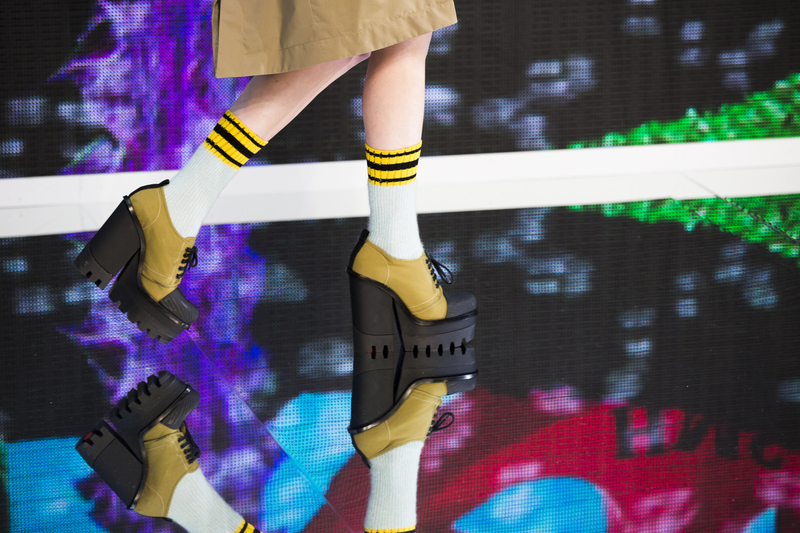 There was hardly a Wellie in sight on the Hunter runway this season. Instead, the English brand opted for waterproof platforms heels, Oxfords, booties, and sneakers to protect our feet from the elements. The result was an undeniably cool collection that will have you eager to trade in those clunky Wellies for a sleeker model. Although the new Hunter Original collection won't be hitting stores anytime soon, you don't have to wait until next spring to stock up on non-traditional rain boots. I've searched the far corners of the Internet to bring you a selection of awesome waterproof shoes that won't ruin your outfit. The best part? They're all available for purchase as we speak. Make sure you have that credit card on hand. You have to look reeeal close to tell that these are made of rubber. Who knew it could be so hard to tell the difference between designer and Timberland? Charming flats that you can sport during a thunderstorm? Sign me up! As edgy and high-fashion as you could want a boot to be — plus they won't get destroyed if you're caught in a downpour. A classic black and white flat, weatherproofed. Simple and totally wearable with a punch of bright color. Tough, studded motorcycle boots you can wear when skies are grey! These are not your grandfather's driving shoes. A work shoe that's so functional you'll never need to match your outfit to your rain boots again. Tough buckle details make this the most badass waterproof boot around.